The world pop band Abjeez, led by Iranian-born sisters, has released a new music video calling on men to support the growing movement to end Iran's ban on women in sports stadiums. Sponsored by the Center for Human Rights in Iran (CHRI), Abjeez's "Stadium" was released today on the heels of a multi-language campaign by a coalition of human rights groups urging the Federation Internationale de Football Association (FIFA) to demand that Iran end its discriminatory ban before the start of the World Cup in June. Abjeez, the first female-led Persian-language Reggae/Ska band, is led by singers Safoura and Melody Safavi, who wrote "Stadium" as a call to Iranian men to join the women's movement. To have me by your side is your right. It's my right! "Iranian women are at the forefront of these protests [to end the ban]," Melody Safavi told CHRI. "Theyare extremely strong, fearless and creative." "The question is, are our men ready?" asked Safoura Safavi. "FIFA's own rules say it won't tolerate discrimination of any kind, yet it has done nothing to end the ban on Iranian women in stadiums," said CHRI's Executive Director Hadi Ghaemi. "FIFA should uphold its own policies by showing Iran that it will be very costly to continue discriminating against women," Ghaemi added. Article 4 of FIFA's statutes says discrimination of any kind against a group of people is "strictly prohibited and punishable by suspension or expulsion." Although women are not legally banned from entering sports arenas in Iran, the discriminatory practice-demanded by hardline religious conservatives-has been an unofficial policy of the Islamic Republic since the 1979 revolution. On March 2, FIFA President Gianni Infantino said Iranian President Hassan Rouhani had "promised" during a meeting in Tehran that women in Iran would "soon" be allowed to enter stadiums. But a day earlier, 35 women were arrested for trying to enter Tehran's Azadi Stadium, where Infantino watched a soccer match. "Women are braving arrests and imprisonment for peacefully trying to enter stadiums in Iran," said Ghaemi. "FIFA and human rights defenders around the world should support them and demonstrate the unacceptability of Iran's behavior by imposing costs for this discrimination," he added. 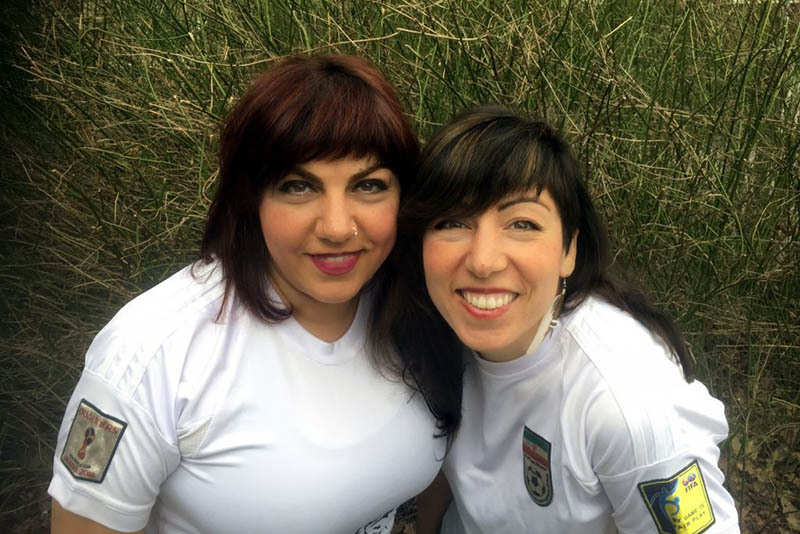 When asked what the couple dancing in the "Stadium" video symbolize, the Safavi sisters said, "They symbolize equality, strength, unity, cooperation, passion and completion. A reality that we envision for Iran!"